Arsenal will on Thursday welcome Bate Borisov at the Emirates Stadium and they will be hoping to win this game with a huge margin because they lost 1 nil in the first leg of this Europa League encounter. Arsenal boss Unai Emery left Mesut Ozil at home because the German international had trained once before they flew to Belarus. Mesut Ozil will start training on Monday with the rest of the Arsenal squad and most of the Arsenal supporters are hopeful that Unai Emery will this time include him in the starting eleven that faces Bate Borisov at home. 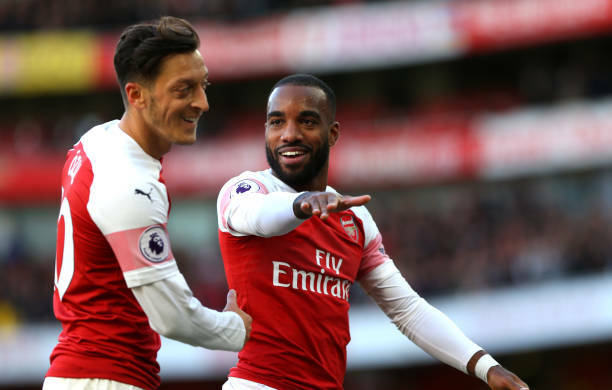 Alexandre Lacazette got red carded on Thursday after hitting a Bate Borisov player with his elbow but there’s a way how this could indirectly be good news to Mesut Ozil. Arsenal head coach Unai Emery has this season used Mesut Ozil in various positions but we all know that the German international is most effective when the gunners are using a formation that will see him start as a Central Attacking Midfielder (CAM). The 4-2-3-1 formation requires a (CAM) so since Aubameyang will be the only available striker, then Unai could possibly use that formation since he won’t try to use a formation that supports two strikers ( Lacazette and Aubameyang ). Mesut Ozil will be behind Aubameyang and the gunners will of course have gone back to using four at the back since Sokratis and Koscielny work well together unlike when Shkodran Mustafi is paired with either of them. Sokratis also did not travel with the team to Belarus but him and Ozil will this time take part in all training sessions done before Thursday’s game because they are back in full training. So Lacazette’s red card will indirectly help Mesut Ozil to be used in his preferred position on Thursday when they welcome Bate Borisov at the Emirates Stadium for the second leg of the UEFA Europa League round of 32.